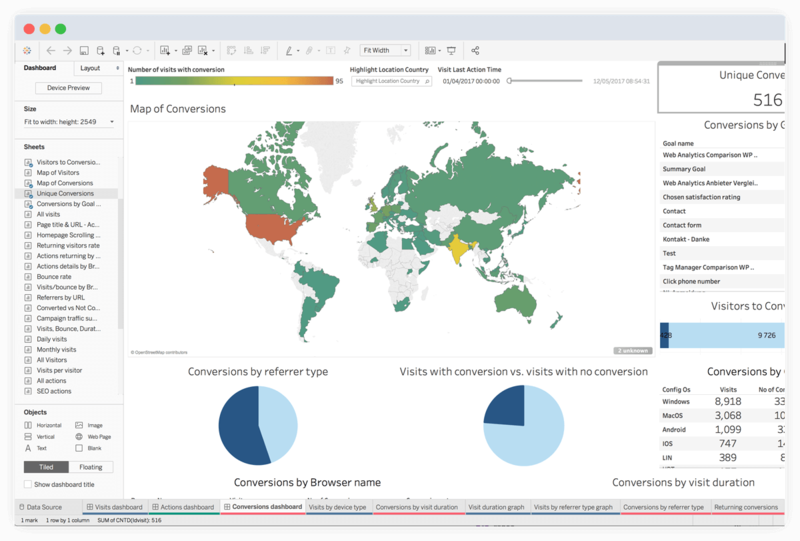 Integrate Piwik PRO with Tableau to get new methods of visualization, produce custom reports, and make informed decisions in minutes. What can you achieve by Custom Reporting with Tableau? Tableau easily integrates with your Piwik PRO data and automatically transforms it for use on the platform. Build data-rich workbooks with efficient dashboards and custom reports free from the hassle of complex database queries. Adopt forecasting techniques and highlight data points to make better informed decisions. Take advantage of flexible deployment and choose Tableau integration with Piwik PRO in the cloud or with your on-premises infrastructure. With Tableau integration you can obtain actionable insights from your Piwik PRO data. Easily build and share data-rich, intuitive dashboards across your organization in just a few clicks. Tableau detects types of data, adapts them to your data sets, and presents them in real time. Tableau integration provides interactive and immersive visualizations across your entire digital workspace. Tableau recommends the most suitable visual data representations for your data sources. Give all users of your Piwik PRO data the power to create and share visualizations for better understanding of your data within the team. As Tableau is available in both cloud and on-premises versions, it can be integrated with your security protocols and adhere to your compliance requirements. Industries handling sensitive data can benefit from the extended features offered by Piwik PRO with Custom Reporting. Custom Reporting with Tableau involves minimal effort and doesn’t require IT assistance. Anyone can create new visualizations and explore Piwik PRO data. Beyond this, analytics experts can dive even deeper and prepare more comprehensive reports to share with the team. Collect all the data you need with Piwik PRO in a safe and responsible way. Wield Tableau’s dynamic visualizations and powerful data processing tools to get the most out of your data. The integration allows you to protect user privacy and stay compliant without sacrificing deep data-based insights. Stay up-to-date on the situation. Use Custom Reporting with Tableau to create data dashboards that quickly shed light on obstacles and reveal new opportunities. Easily customize your dashboard and reports to focus solely on the data your team needs for your business. You can save, publish, and e-mail custom Tableau reports to quickly share them with your colleagues. Make data-driven decisions the standard in your team.